PanARMENIAN.Net - VivaCell-MTS announced on Tuesday, July 3 that the Internet in MTS Russia network will be available for only 9 drams per 1 MB by September 30. 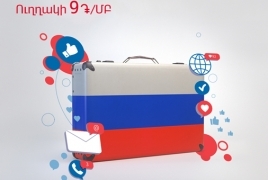 For each of minute of incoming calls and calls to VivaCell-MTS and MTS Russia 25 drams will be charged, calls to other Armenian networks will cost 50 drams per minute, those to other networks of Russia will cost 100 drams. 9 drams will be charged for each outgoing SMS.